On behalf of our Executive Board I want to welcome you to our website. We strive to make this a valuable tool for our members and informative for those interested in learning about our Association's purpose. The Wisconsin Chapter of the FBI National Academy Associates is dedicated to enhancing, supporting and encouraging professional cooperation among law enforcement agencies throughout the country, especially within Wisconsin. It is through the exchanging of information, training and networking that our members develop professional relationships that assist in our daily duties and enhance the standards of professional conduct at all levels of law enforcement. The strength of our organization lies in its members and their commitment to actively participate in our various events throughout the year. I encourage all of our members to support our mission by attending events that our Board of Directors have organized. We are also committed to supporting various charitable organizations as shown on our website. Please take note of our sponsors as they contribute greatly to our ability to provide opportunities for our members. I am honored to serve as the 2018-2019 President of the Wisconsin Chapter of FBI National Academy Associates. What is the FBI National Academy? The FBI National Academy is a professional course of study for U.S. and international law enforcement leaders that serves to improve the administration of justice in police departments and agencies at home and abroad and to raise law enforcement standards, knowledge and cooperation worldwide. 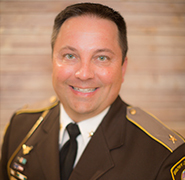 Its mission is "to support, promote, and enhance the personal and professional development of law enforcement leaders by preparing them for complex, dynamic, and contemporary challenges through innovative techniques, facilitating excellence in education and research, and forging partnerships throughout the world." 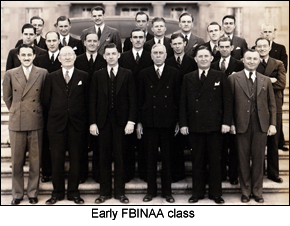 The ten-week program was established in 1935 by J. Edgar Hoover and is held at the FBI Training Academy in Quantico, Virginia. For each training session, four police executives from Wisconsin police agencies are selected to attend or 16 per year (there are four sessions per year). Approximately 250 law enforcement executives graduate during each session from all over the nation and the world. The Wisconsin Chapter of the FBI National Academy Associates is created and organized to promote law enforcement leadership and cooperation in the State of Wisconsin, through continuing education and training, thereby enhancing the standards of professional conduct at all levels of law enforcement. Who makes up the Wisconsin Chapter of the FBINAA? Our Wisconsin Chapter of the FBI National Academy Association (FBINAA) is made up of over 400 law enforcement command level officers from around the state. It is comprised of personnel from Federal, State, Tribal, County and Municipal departments who are dedicated to their profession, their communities and the Wisconsin Chapter of the FBINAA. In 2008, our Wisconsin Chapter hosted the National FBINAA Conference in Milwaukee, Wisconsin. The theme of that National Conference was "Partnering for a Safer World," which focused on public-private partnerships and the reality that law enforcement cannot do it alone. With you and your organization as well as other private partners, we here in Wisconsin can build relationships and work together to provide a safer environment for all. WIFBINAA Youth Leadership application period is closed. The WIFBINAA President's Scholarship application period is now open.